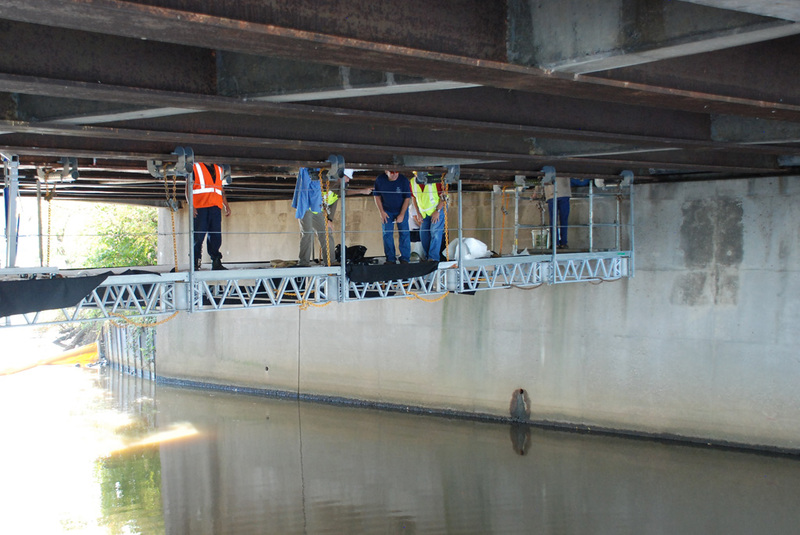 Ever wonder how they do bridge repairs over water? A hanging scaffold system! This is very unique way to get beneath bridges to make repairs. Instead of anchoring a barge in the water beneath the bridge, or parking a giant truck with a bridge inspection bucket (like a cherry picker with a platform) above it they can suspend a platform from the steel beams and girders beneath the bridge itself. I was on it yesterday and it’s as stable as traditional ground based scaffolding. I was shocked. 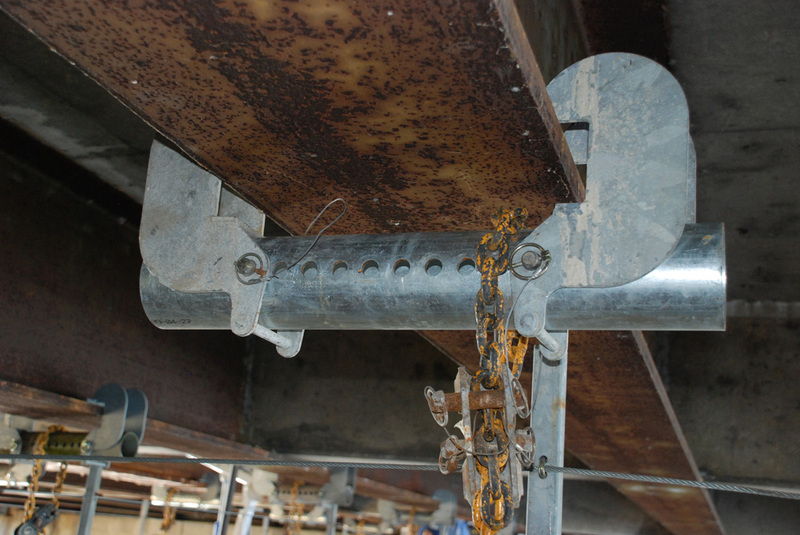 Those brackets essentially hold the weight of the scaffold platform beneath it and all of the workers, equipment, and parts necessary to make the repairs. It’s really a very cool way to get beneath a structure like that. This photo shows the pipe that was leaking and is now being repaired. This way, entire crews can work beneath the bridge without being limited to a small platform on a bucket truck. For instance, on this job, crews are removing and repairing large sections of pipe over the river. 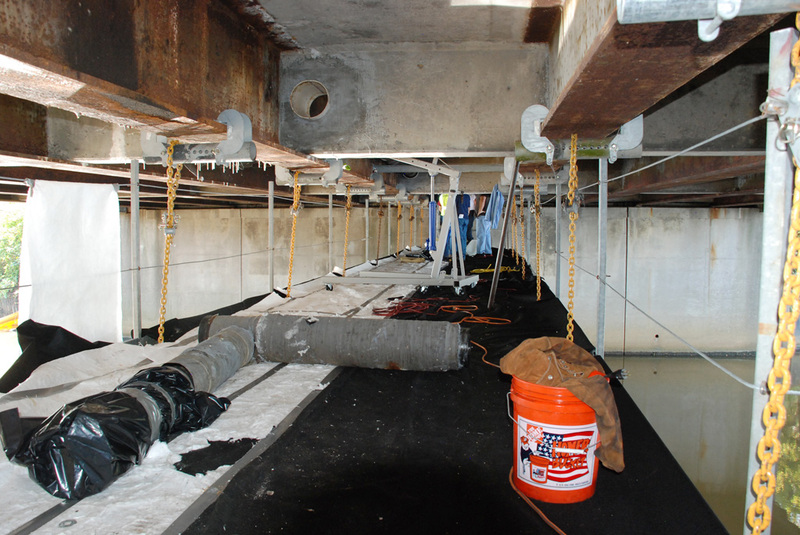 This hanging platform system prevents leakage into the water below and allows for much greater mobility. 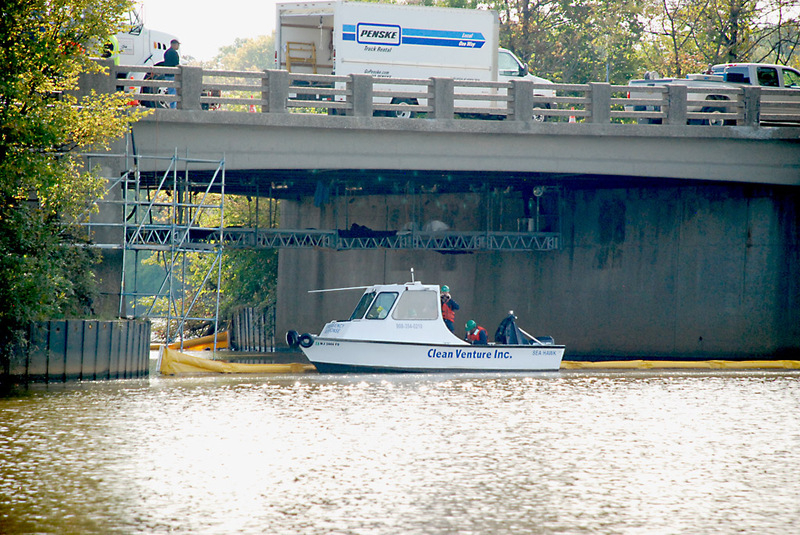 It also allows the bridge and waterway to remain open for business as usual. Superior guys did a heck of job on this one. Really smart and stable! Posted on October 11, 2011, in Suspended and tagged barge, best, bridge maintenance, cool, Ever wonder, facebook, fun, hanging, how do they do it, Maintenance and operations, neat stuff, pipe repair, Repair, river, scaffold, Suspended, twitter, water, youtube. Bookmark the permalink. 2 Comments. Very well written post. It will be beneficial to anybody who employess it, as well as me. Keep up the good work – for sure i will check out more posts.